“When I let go of what I am, I become what I might be. of every sentient being’s core. peaceful rivers flowing into eternity. to the notion of letting go. revealing potency that has always been there. embracing the vastness of empty awareness. while seeking clarity in the mists of Pokhara. I just spent 5 weeks in Nepal, most of that at a yoga teacher training retreat in Pokhara, an 8 hour mountain bus ride (not for the faint of heart) west of Kathmandu. White knuckles at times but scenery that made it well worth it. 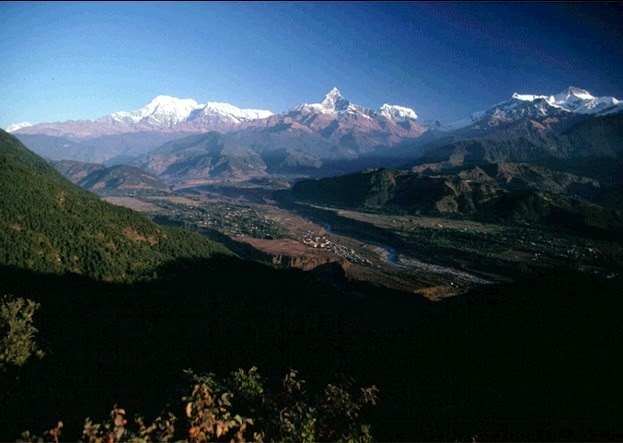 Many hours of yoga on a terrace surrounded by the Annapurna range with 8000 meter peaks of the Himalaya. An introspective exploration through the lens of self scrutiny makes for life altering, mind-body shifting awareness that only this kind of experience can deliver. Physically demanding, spiritually challenging and a peeling back emotionally, leaves one rather naked like an open book. “Wang, shang, ksang, sang, Wang shang, ksang, sang” these are words from a Chakra meditation and would be chanted repeatedly so fast that it totally sounded like a runaway train. Perhaps “you had to be there” to really get the gist; suffice it to say it works. This has been an amazing journey of shifts that have enriched and altered my life in many ways, the mists of Pokhara.